Ten Broeck set six American speed records during the 1870s at distances ranging from one to four miles. A bay son of Phaeton out of the Lexington mare Fanny Holton, Ten Broeck was bred in Kentucky by John Harper, who had already enjoyed great success in racing earlier in the decade with Longfellow. When Harper died in 1875, Ten Broeck passed to his nephew, Frank Harper. Ten Broeck debuted as a 3-year-old n May 10, 1875 in the historic Phoenix Hotel Stakes at Lexington. Ten Broeck was an easy winner in a field of six, which also included Aristides. A week later, Aristides turned the tables by winning the inaugural Kentucky Derby at Churchill Downs. Ten Broeck finished fifth and was rested until the fall. After finishing fifth in a six-horse field in his return, Ten Broeck began to figure things out and set out on a path to stardom. He established the first of his records on Sept. 9, covering 1 5/8 miles in 2:49 1/4, lowering the American record by 3 3/4 seconds. Ten Broeck added wins in the Post Stakes, Merchants’ Post Stakes and the Maxwell House Stakes that autumn. 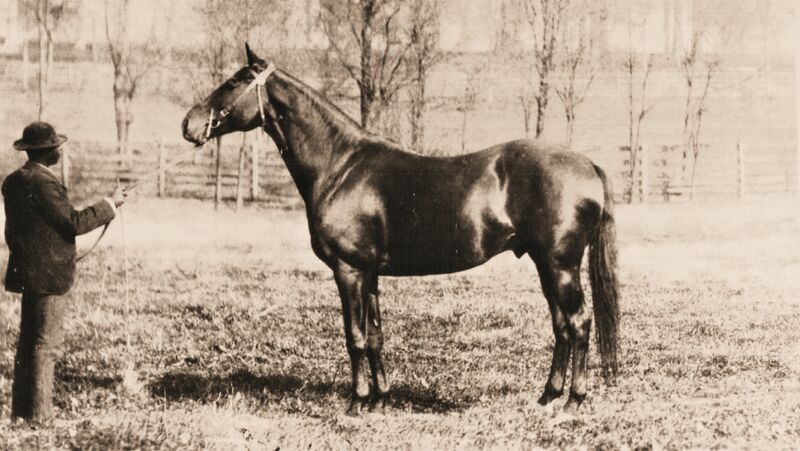 Ten Broeck began his 4-year-old season in 1876 by finishing second to old nemesis Aristides, who set an American record of 3:34 1/2 for 2 1/8 miles in the process. It was the only defeat of the year for Ten Broeck, winner of his next 15 starts and 18 of his next 19. His 1876 victories included the Louisville Cup and Galt House Plate in May and three American records in the fall. At the Lexington track in September, Ten Broeck covered 2 5/8 miles in 4:58 1/2. He followed that a week later at Churchill in the Post Stakes by lowering the American mark for three miles to 5:26 1/2. Four days later, Ten Broeck broke Fellowcraft’s four-mile record, clocking in at 7:15 3/4, almost four seconds better than the previous standard. Competition was scarce for Ten Broeck as a 5-year-old. On May 24, 1877, he set a new American record for one mile (1:39 3/4) at Churchill. Five days later, Churchill management offered Harper half the gate if Ten Broeck could beat True Blue’s American record of 3:32 1/2 for two miles. Ten Broeck delivered, smashing the mark by five seconds for his sixth American record. He added four more wins in the fall to extend his win streak to 15. Ten Broeck’s streak was snapped in his next race, a showdown with Parole and Tom Ochiltree at Pimlico on Oct. 26, 1877. Heavily favored, Ten Broeck finished second to Parole in one of the most celebrated races of the century. Ten Broeck immediately returned to his winning ways two days later by winning the Bowie Stakes in four-mile heats. He won in dominant fashion in 7:42 1/2 and 7:40, distancing his overmatched rivals, including Belmont winner Algerine. A scheduled rematch with Parole fell through when Harper was not pleased with Ten Broeck’s training. Continuing to compete as a 6-year-old in 1878, Ten Broeck won a sweepstakes at Lexington in May, defeating his old nemesis Aristides. He met one more challenge, the 5-year-old California mare Mollie McCarthy, in a match race at Churchill on July 4 before a crowd of more than 25,000. The $10,000 purse was the richest event of Ten Broeck’s career. The contest was not expected to be easy, as Mollie McCarthy was undefeated in 13 starts. Ten Broeck, however, handled the great mare with ease, distancing her in the first four-mile heat to win the race. Ten Broeck was retired after his brilliant effort against Mollie McCarthy. His final victory became the subject of folk songs throughout Kentucky. Standing stud at Nantura alongside Longfellow, Ten Broeck sired Travers winner Bersan, Kentucky Oaks winner Ten Penny, Tennessee Derby winners Ten Strike and Jim Gray and Alabama winner Tolu.